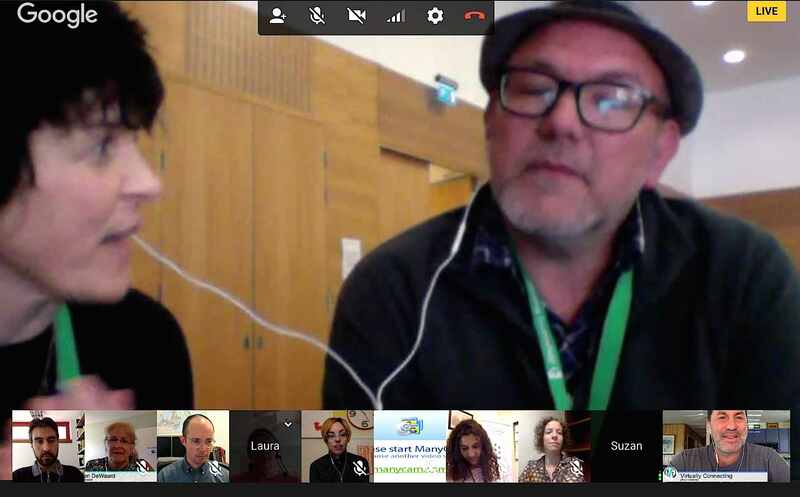 Today Virtually Connecting hosted it’s one session at the OER16 Conference in Edinburgh. We typically would have done more, but Virtually Connecting has a pile of sessions at the overlapping OLCInnovate Conference. I leaped at the chance to host today’s one with keynoters Jim Groom and Catherine Cronin. Jim of course I have known and collaborated for eons, but Catherine I have yet to meet, and although we have crossed paths in blogs and shared stories, we have never had a conversation. And I have been envious of all the people who got to go to the conference, and for Edinburgh, and what looks like a trend setting vibe for a conference. It was scheduled at 7:30am my local time, not too difficult to arrange, but… I wanted to be ready and informed by Catherine’s keynote (Jim’s is tomorrow), so with some alarm assistance, I woke up at 2:30 am to tune in. I’m not here quite to review her talk If ‘open’ is the answer, what is the question?. I cannot recommend it highly enough: Two things Catherine said rang a bell. She was describing her research in interviewing educators about their reluctance to sharing, that many women scholars report real concerns given experience with shaming to unfairness to abuse. And she said something like “and no amount of powerful stories about the benefits of sharing will help them.” (I am working from sleepy memory, and a bit lazy to find the passage, it’s the gist that counts here). But that felt like she was talking about all the stuff I have done to use “Amazing” stories as a motivator. It felt like she was talking directly to me… but not in a critical “you’re wrong sense”. It was more like she was asking me to think more deeply about this. It was later in the day that I sorted that the stories I collected were ones from people who had already made the step over the barrier of sharing; their were more affirmation stories than conversion ones. I’m still ruminating. That’s what great talks do, right? The other strong takeaways I got from her talk was how she posed the question of how we can think about the interplay of openness and privacy, plus the insight that we need to be wary of equating openness and goodness. Oops. I said I was not going to review the talk. But that was my prep. Anyhow we had a great lineup of virtual buddies, actually more than we had space. Caroline Kuhn tried against bad connection odds to tune in from Venezuela and gracefully left to give space. We had Dimitris Tzouris, Susan Adams, Jamison Miller, Laura Gibbs, Lisa Hammershaimb, Nadinne Aboulgmad, Maha Abdelmoneim, and Helen DeWaard (Maha Bali joined us later). For not having much time in their break, Jim and Catherine really packed it in with ideas for us to think about. Enjoy the archive, we had a rather extensive discussion after our on site buddies had to go. There is the parts about the challenge of openness Catherine talked about in her keynote, and what seems like profound differences on openness in Europe compared to the US. The feeling I got from today’s events was for all the gains in openness, it almost seems like it was the easier stuff (content) to take on (and given the message of Pat Lockley’s grim video, even that has fallen short?). Now, maybe with the movement hitting a maturity level, we are really looking at big challenges, many which are not technogical. I also highly recommend reading Laura Gibbs reflection on the Virtually Connecting hangout – she actually reviewed it more than me! But aren’t Catherine and Jim adorable sharing the headphones? 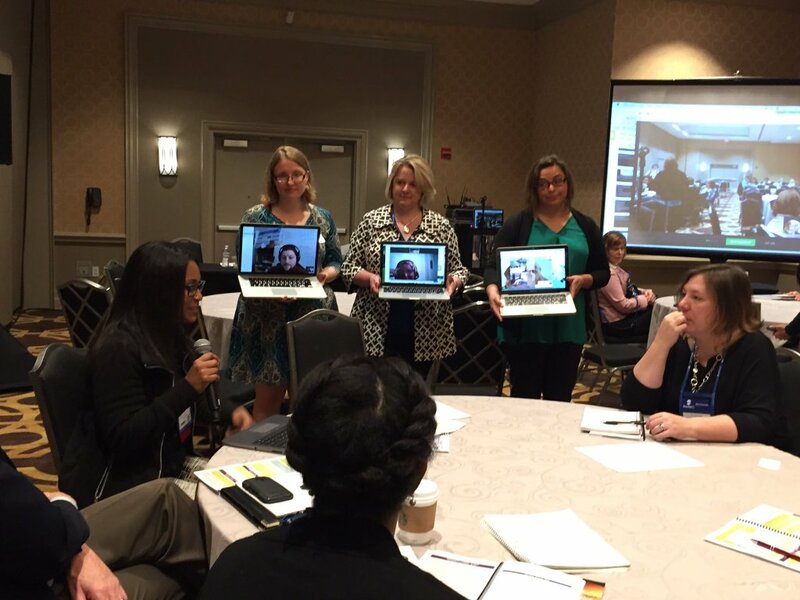 And if you are interested in being part of Virtually Connecting, see the events happening the rest of the week at OLCInnovate or the information on how to get involved. The post "Literally [Ear] Buddies: Virtually Connecting at #OER16" was originally cracked open and scrambled from a rotten egg at CogDogBlog (http://cogdogblog.com/2016/04/literally-buddies/) on April 19, 2016. Enjoyed this! New images of ‘connectedness’! The real and virtual ways we connect so we can hear each other speak!